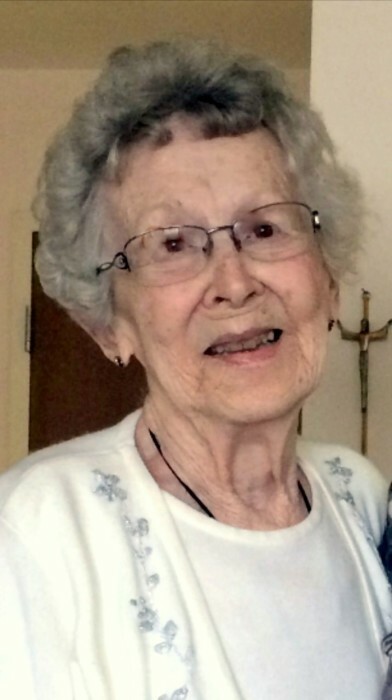 Elizabeth “Betty” Staup, 85, of Delphos, passed away on March 30, 2019, at the Meadows of Kalida. She was born March 1, 1934, in Delphos to August and Margaret (Pohlman) Friemoth. She was united in marriage to John “Gary” Staup on January 10, 1953; he preceded her in death on February 15, 2010. She is survived by two sons, Michael (Robin) Staup of Buchanan, MI and Timothy (Lisa) Staup of Delphos; one daughter, Valerie Gerdemann of Columbus; four grandchildren, Gina (Ryan) Spring, Jeff (Kelly) Gerdemann, Kurtis (Kylee) Staup, and Kyle Staup; one brother, James (Cecelia) Friemoth of Delphos; one sister, Mary Jane (Arthur) Eversole of Middle Point; one sister-in-law, Ruthie Friemoth; one brother-in-law, David Weisgerber, and five great-grandchildren, Mikayla and Eli Spring, Keegan and Vayda Staup, and Nathan Gerdemann, as well as many nieces and nephews. She was preceded in death by her grandson, Kent Staup; brothers, Robert Friemoth and David Friemoth; sister, Carol Weisgerber; half-siblings, Leo (wives, Magdalina and Marie) Friemoth, Richard (Dolly) Friemoth, and Alice (John) Neumeier. Betty was a graduate of Delphos St. John’s and a member of St. John the Evangelist Catholic Church. She was a devoted wife, mother and grandmother. She enjoyed gun shows, garage sales, gardening, bird watching and music. She also loved rock collecting and exploring caves across the country. Betty did not know a stranger as she could strike up a conversation with anyone. She had a true genuine interest in people. She would often stop and talk with her neighbors on her daily walks. Betty always believed the brain needed to stay exercised and her evenings were spent watching Jeopardy, doing crossword puzzles, knitting and reading. If you wanted to try to match wits, Betty enjoyed a good challenge. She touched many lives and leaves lasting and wonderful memories. A Mass of Christian Burial will be held at 11:00 a.m. on Tuesday, April 2, 2019, at St. John the Evangelist Catholic Church. Father Dennis Walsh and Father Jacob Gordon will co-officiate. Burial will follow in Resurrection Cemetery. Visitation will be held from 2:00-8:00 p.m. on Monday, April 1, 2019, at Harter and Schier Funeral Home where a Parish Wake will be held at 7:30. Memorial contributions may be made to The National Rifle Association or St. John’s Parish Foundation.